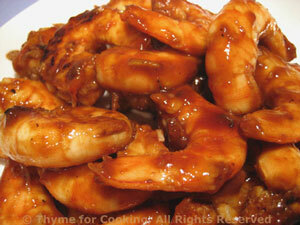 Barbecued Shrimp, Thyme for Cooking easy recipes. Note: cook an extra 6oz (180gr) shrimp for tomorrow. We'll use more pepper during the week. 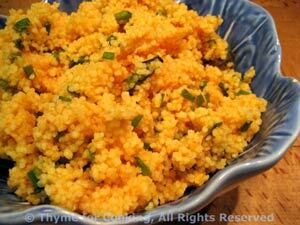 If you prefer, substitute fried, sliced potatoes, sautéed onions or sliced tomatoes. Everything else stays the same. You can trim the rind off of the Brie, or not. Because the Brie is rather runny, I didn't flip this. Cut the zucchini in 1/8" (.3cm) thick slices. You want enough to cover the bottom of the pan in one, non-overlapping layer. Heat oil in medium, 9" (23cm) nonstick skillet or omelet pan over medium heat. Add zucchini slices and sauté 5 minutes. Turn and sauté another 5 minutes. Pour half of the eggs over the zucchini. Let cook until almost set. 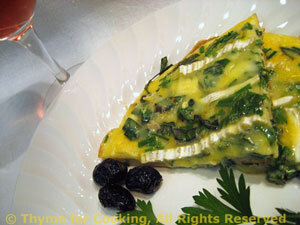 Slice the Brie and lay on top of the eggs, sprinkle with parsley and pour the rest of the eggs over the top. After about 5 minutes, lift cover and check. If center is not set lift the edge of the omelet and pour 1 tsp of water under. Quickly replace the cover and let cook another 3 minutes. That should finish it off nicely. (if, for some unknown reason it doesn't, repeat the trick with the water - it creates steam to cook the top.) The top will not be brown. Slide it carefully onto a plate. Cut it into quarters. 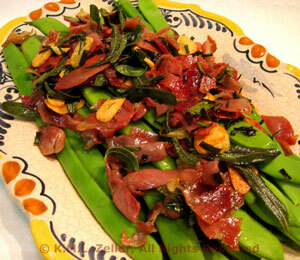 Arrange 2 quarters on each plate, garnish and serve.